Introduction: Laparoscopic Sleeve Gastrectomy (LSG) has become an increasingly common operation offered to morbidly obese patients seeking bariatric surgery. There is minimal basic science data regarding the thickness of transected stomach as the limits of smaller gastric sleeves are created closer to the lesser curvature. The purpose of this study is to determine the tissue thickness along the staple line and examine what factors (such as gender, location, and body mass index (BMI)) predispose to thicker tissue. Methods: The study design was a single center, single surgeon, non-randomized, prospective study of patients undergoing LSG. The patients must not have had previous gastric or esophageal surgery. The initial staple firing was 4cm from the pylorus and the sleeve was created over a 32 Fr bougie. 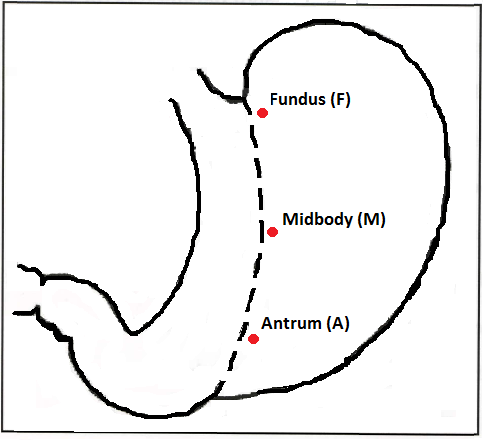 Excised sleeve gastrectomy specimens, with patient consent, underwent tissue measurement at three specified locations: antrum 3cm up from the greater curvature, midpoint of the entire staple line, and 1cm down from the fundus closest to the gastroesophageal junction (Figure 1). A tissue thickness measuring device was utilized to acquire readings after a 15 second wait period at a tissue pressure of 8 g/mm2, the standard by which modern tissue staplers are measured. Data was analyzed by univariate analysis using a student’s t-test. Results: Over a period of nine months, Oct 2011 to July 2012, we met our goal enrollment of 50 resected gastric sleeves. Most of the patients were female (80%) and Caucasian (92.5%). Average age was 42 years old (19-60) and average BMI was 49 kg/m2 (34-82). Average specimen weight was 134 g (76-371) and average total staple line length was 264 mm (160-370). Tissue thickness was significantly different (p<0.01) at each location with the antrum being the thickest at 2.70 mm, followed by the midbody at 2.33 mm, and the fundus was the thinnest at 1.97 mm. Male gender was associated with thicker tissue but was significantly different only at the antrum (Table 1). BMI had an effect on thickness, but was only significantly different at the antrum when BMI was over 50 kg/m2 (Table 2). Conclusions: Tissue thickness of excised sleeve gastrectomy specimens varies based on location with the antrum being the thickest. Both BMI (> 50 kg/m2) and gender (male) are associated with increased tissue thickness, but only in the antrum. These considerations must be taken into account when selecting the proper staple height cartridge for gastric transection when performing LSG.